Upon entering Villa Samadhana’s traditional Balinese gateway, the grandeur of this magnificent property is immediately apparent. From here, a wooden bridge traverses a large lotus pond overlooking the manicured sprawling lawns that extend all the way up to the main house. To the left of the lotus pond rests a self-contained two-bedroom guesthouse with lounge and equipped kitchen. The principal residence, located to the rear of the property, features a master suite with ocean views, TV lounge, kitchen, two guest rooms and a large open living and dining pavilion that looks out onto the rolling lawns. A separate entertainment pavilion with an outdoor dining terrace sits next to the 25-metre pool, offering great views of the ocean across the neighbouring rice fields. Guests are officially welcomed to Villa Samadhana in the large open-sided living and dining pavilion which is cooled by ceiling fans hanging from high vaulted ceilings above polished terrazzo floors. Making the most of its incredible surroundings this area overlooks the rolling lawns and striking silver-blue Madagascan palm trees. The living area features low white-cushioned sofas, two wooden daybeds tastefully decorated with red silk cushions and a scattering of interesting artefacts. The dining area presents a solid teak table (seats 12) and is perfect for a Balinese banquet. To the rear of the living pavilion is the air-conditioned TV lounge which features a large flat-screen satellite TV, DVD player and surround-sound system (which also feeds the adjoining living and dining area). For those that would rather chill out and read a book, the room opens onto a lovely timber deck overlooking a fish pond. One of the most important rooms in the house – the kitchen – sits behind the TV lounge. The kitchen is also accessed by a long, brushed-concrete promenade displaying a fine collection of Asian antiquities. Featuring polished granite work tops, commercial stove, wok burner and lots of cupboard space it is perhaps one of the biggest private kitchens on the island. The kitchen also opens onto a timber deck and fish pond that is home to three auspicious Arowana fish. The enormous entertainment pavilion, one level down from the living and dining area and presenting ocean views, is the ultimate poolside retreat. With an alang-alang thatched roof and Palimanan stone floor, this room is cooled by ceiling fans and the natural sea breeze. The pavilion includes a billiard table, TV, DVD and stereo system, sofa, polished concrete bar with bar stools and washroom. The rear wall of the bar (including the fridge and water cooler) is painted with a batik motif to match the cushions on the lounge suite, adding a sense of fun and vibrancy. A highlight of Villa Samadhana is the landscaped garden. Designed by one of Bali’s best landscape architects, Trevor Hilliar, the rolling manicured lawns, running water features, exotic trees, palms and flowering plants complement the villa beautifully to give it its unique sense of space. The lawn area directly below the living and dining pavilion is larger than a football field and is a great area for the kids to run around in, or to host a wedding party. Not only do children love this space; so do the native birds, lizards and butterflies. Keen swimmers will relish the 25-metre infinity pool with its spectacular ocean views, and there’s a shallow section for children and those who would rather just lie back and relax. The poolside deck, furnished with sunloungers and a white-curtained daybed provides the perfect setting to laze the days away. For dinner parties under the stars ask Gede, the villa manager, to set up the stone table (seats 14) on the outdoor terrace, which also features a large standing menhir stone. The impressive air-conditioned master suite is housed in its own pavilion separated from the living and dining area and the kitchen by fish ponds and frangipani trees garlanded with orchids. Stepping stones lead to a set of carved wooden doors that open to present a welcoming Buddha statue and private Palimanan stone terrace. Glass doors reveal the suite’s TV lounge furnished with two grey-silk sofas and floor cushions for watching movies on the large flat-screen satellite TV with DVD player. Adjacent to the lounge, a small reading room enclosed by glass appears to float above a fishpond, offering glimpses of the swimming pool through an opening in the surrounding coral-limestone wall. The bedroom itself, with its vaulted ceiling, dark teak floors, king-size bed and glass sliding doors, opens onto a private deck overlooking lawns dotted with coconut palms, and through to the crashing waves in the distance. A huge dressing area divides the bedroom from the semi-open ensuite bathroom featuring a large rectangular terrazzo bathtub, his and her vanities and walk-in rain shower. White shutters open onto a private garden bathroom with an outdoor shower encircled by six stone pillars and soft maiden-hair ferns. The brightly decorated air-conditioned guest rooms, located in a separate structure adjacent to the dining area, have been designed for children but can easily accommodate adults. One of the rooms has a queen-size bed with large flat-screen satellite TV and DVD player, while the other has twin beds and a small outdoor balcony surrounded by a lily pond. A corridor with built-in wardrobes connects the two rooms as well as providing access to the shared bathroom. Featuring grey slate walls and floors, with an indoor terrazzo bathtub and walk-in shower, the bathroom also has an outdoor shower with a cascading water-wall feature. Both rooms open onto a shared wooden deck with a daybed for relaxing. Fifty metres from the main house rests Villa Samadhana’s two-bedroom guesthouse with its traditional alang-alang roof. Light and airy with cream walls and teak floors, both air-conditioned rooms feature queen-sized beds with batik throws, garden bathrooms with indoor shower and glass sliding doors that open onto a wooden deck bordering the immaculately manicured lawns. One of the bedrooms has a window seat to soak up the sun while the other has a daybed for those inclined to take an afternoon nap. Between the two bedrooms is a small living area with a self-contained kitchen and breakfast bar with bar stools. Thank you for a fantastic time. With our family all joining us from Australia to Canada, your friendly faces, the beautiful grounds and wonderful facilities really topped of an amazing 10 days. We will definitely recommended to friends. Thank you for a wonderful stay. We celebrated our mom's 70th here and it will always be memorable. Special thanks to Krisna who was a wonderful host. Looking forward to coming back. Thanks so much to all the staff. We had such a great time over the last 10 days. The villa is amazing with so much space. The food was lovely and the service fantastic. We will be back, thanks so much. We had special time in villa Samadhana. Staff are very kind and friendly. They supported our stay in this villa, especially the unforgettable memory is taking a Japanese food dinner with the staff in this villa. We enjoy it! We would like to come again! Thank you very much. We had an amazing stay at villa Samadhana for our wedding. The entire villa is beautiful and made for some excellent photos of our ceremony. The staff was very attentive and helped us out with any big or small problems we had. The meals they prepared were delicious as well we enjoyed our American Breakfast, our welcome BBQ and especially the pizza and french fries. We absolutely loved our stay in this little piece of paradise. The staff were so accommodating, friendly and helpful, this is our 3rd to Bali. Thank you for your service and all the best for the future. All the staff were very friendly and professional. A very big thank you to the chefs for keeping the food gluten free. Thank you very much for a lovely holiday in Bali. Thank you so much for being so amazing. The staff have been so kind and hospitable and the villa is absolutely stunning. The wedding was so special and we thank you for helping us making it what it was. We will always look back on this trip with fond memories and hope to come back again in future. Wishing you all the best and god bless. Thanks to this "fantastic" team, we spent a great week in Bali. Their kindness was real and sensitive. The house is a great space of relaxation and peace. We really enjoyed this moment here and hope to come back. We had an amazing holiday at Villa Samadhana! Our family loved our time here and can not wait to get back. The pool was amazing and we loved the food and fresh fruit. Thank you for the great service, attentive, detail and fun. We had such a wonderful time as an extended family with grandma and 4 children. We all loved the beautiful grounds, living spaces and the wonderful team who made so much effort to welcome us and make our stay perfect. It was truly a paradise staying at Villa Samadhana. The service, the garden, pool and villa itself are phenomenal! We enjoyed ourselves very well with a trip to Ubud, Sanur and the occasional run along the black beaches of Ketewel. Thank you all for welcoming us and taking such good care of us and off course - the food was splendid! We will look back at our stay here with great memories and the kids especially liked the dance of the girls from the village. Thank you for such a lovely relaxing long weekend. The team are so lovely, the grounds beautiful and we enjoyed ourselves enormously. Thank you so much for sharing the villa. Thank you for all the staff. The villa and grounds are beautiful and the food was very delicious. We will definitely come back again. Thanks. We have been to many villas in Bali, but Villa Samadhana has turned out to be our favorite. This was our first stay but would love to come back. I would recommend this to anyone. Terima kasih banyak. Thank you. The villa is very beautiful, service was friendly and food was tasty. Special thanks to Krisna and Agus. Also thank you for arranging the yoga, massages and rafting. We have had an amazing time at Villa Samadhana. My partner and I got married here and we have had an unforgettable experience with our families. The staff have been very friendly and attentive and they have made our experience at the villa. The villa grounds are absolutely stunning and we can't wait to visit again. We loved staying at Villa Samadhana with sun, blue skies, sea breezes and it's beautiful villa set in lush gardens, full of very artistic of tasteful designs. The staff are excellent and have made our stay memorable. We've enjoyed great food and special thanks to putu also krisna. The car was a great asset and gede is a safe and reliable driver who speaks good English. The whole family loved staying here. Thank you so much, very impressed with this villa and experience. The staff have all been amazing, so friendly and great with our kids. After 5 days we all feel so relaxed, our family don't want to leave. Thank you from our family, you have given us amazing memories with our friends that will last a life time. Thank you to all staff member's kindness. The design, scenery and atmosphere at Villa Samadhana are the greatest and best villa we have ever lodged. Every meal, breakfast, lunch and dinner is great. In any case, we want to come back to this villa, we would love to see you again. Thank you for a pleasant and relaxed stay, you and this lovely place gave us the real feeling of no worries. We would wish to thank all of the staff for your friendliness genuine hospitality. We can only join those who are sad to leave. No picture or description can capture the impressions from our stay. Take care of this little pearl and let others enjoy it as much as we have. Thank you once again for our wonderful time at Villa Samadhana. Staff always friendly and helpful. Food was fantastic (again). We are sad to leave but know we will be back again one day. We had the most wonderful time in lovely Villa Samadhana. Thanks to all the members here. Not only the wedding but all the service you have provided was unforgettable and fantastic. Thank you so much for this remarkable experience. Thank you and terima kasih banyak! Pak Krisna, Pak Gede and all the Samadhana staff for their wonderful service. Look forward to seeing you all again in the future. Sampai jumpa lagi depan kali. Thank you so much for supporting us during our wedding. All staff has been amazing and helped us to make the celebration just as we wanted. Most likely the best trip we have been on. Love this place and the staff are AMAZING, only the best. Willing to do anything to keep us happy. Well recommended this place to everyone. Much love to the staff - you guys work so hard. Keep it up. Thank you for everything. We had the most amazing time at Villa Samadhana. The entire staff made our holiday the most special one we ever had as a family. On the beautiful backdrop of the wonderfully groomed gardens, all our wishes were taken care of and our taste buds were satisfied. We can only say " Thank You " from the bottom of our hearts. What a wonderful time we have had! Very quickly you made "Samadhana" our home away from home. and your staff - our extended family. We were so relaxed in this beautiful environment and every need was met with a smile and warm heart. We have always loved Bali and now have yet another reason to return... This is not good bye but we will see you again soon. To the team at Villa Samadhana. We can't thank you all enough for making our holiday here incredibly enjoyable and relaxing. The villa and grounds are magnificent and we especially loved our time by the pool. A big thank you to all the staff especially Krisna and Putu for taking care of our every need with absolute professionalism. The food was delicious we loved the tuna and avocado salad and made our stay extra special. We will definitely be back and will recommend Villa Samadhana to our friends in Sydney. With many thanks. We have thoroughly enjoyed our stay in Samadhana Villa. The facilities such as swimming pool, nice garden, kitchen and all others are excellent. The villa staff have a very good attitude and smile all the way from our entry to complete duration period of our stay. Especially chef cooked variety of fabulous dishes for us to enjoy tasteful foods. Overall our whole holiday trip is fantastic. Thanks to Samadhana Villa staff and management. Good service and villa staff. Thank you so much. We will be comeback again. Dear Gede and staff, such a beautiful stay in beautiful surrounds. We appreciate your efforts with our family, from the 6 year old to the 70 years old. Thank you for your special attention for our birthday celebration. Your hospitality and the beauty of Villa Samadhana took our breath away from the moment we stepped in the front gate. We enjoyed every delicious meal you prepared for us, and then there was the party!. We will cherish this as one of the best parties we have had and to remember for a long time to come. We thank you for accommodating the screaming and mess that comes with having 4 children below the age of 4. Thank You. Thank you so much for your kindness and hospitality. We have had a lovely week. The staff were friendly and helpful and we were looked after very well. Thank you again. Our holiday could not have been better than here, at Villa Samadhana. From early morning until late in the evening we were treated like the royal family. The staff went out of their way to make our stay a wonderful one, from feeding the fish with our youngest to learning how to prepare true Indonesian dishes for the adults. So from the bottom of our hearts: thank you very much. Hopefully we will one day return to Bali and then we will definitely come back to stay at this wonderful place. Thanks to Krisna, Putu, Arik, Ketut Agus and of course Gede for a truly wonderful and relaxing holiday. The staff made us feel very welcome and the villa is extraordinary. Loved the rooms, the pool, the food and beautiful location. All the very best. Many thanks to Putu, Krisna, Agus, and all staff, they are very attentive. Gede the Villa manager has organized all staff to take care the villa guest in a exceptional way. Thank You. In this world there are no words to come all this feeling that gave us Bali and Villa Samadhana. We will miss you. With big love and thanks. To all the fabulous staff at Villa Samadhana. We were all looking forward this weekend so much but even then it has exceeded our expectation. Your kindness, hospitality and forbearance was so appreciated. You have made the birthday celebration such a magical and memorable weekend. Many thanks. We would like to say from the bottom of our hearts, we all had such a fabulous time here.The staff were so awesome!!!. The gardens are so beautiful, it is so hard to leave - is like heaven I am sure. We love you all, we will be back every year for family holiday. Love to you all. We have had a great week at the villa. Fantastic staff and beautiful facilities, Our first trip to Bali has been so great we will be back and will also recommend the villa to our friends. Hope everyone who works at the villa has a healthy year, hope to see you again. Thank you all for a wonderful stay. The villa and grounds are beautiful and all the staff were polite, professional and very friendly. We would definitely recommend the villa to our friends. The food was amazing. The effort the staff go to made you visit enjoyable was beyond expectation. Thank You all. Thank you for a wonderful holiday to celebrate our mom's 70 birthday. Fantastic hospitality and wonderful food. All our needs were catered for plus more. We will be back in the near future. We have many many happy memories of our stay. Thank you so much. We can't thank you enough for such a wonderful time! Our boys absolutely loved running around the grass, playing in the amazing pool and feeding the fish - and we had the perfect relaxing break in this stunning place. Big big thanks to all of the lovely staff who gave us such a warm welcome and thank you for the fantastic meals. What a perfect start to our holiday. Our family of 8 adult and 3 very small children had a wonderful time in this beautiful villa. We loved the: Pool - first class, the grounds - beautifully kept, the fabulous food the cooks prepared for us, the kind and caring staff, the seafood banquet yum !. A wonderful experience for us all to get together in this delightful villa. Thank you for your hospitality, we will highly recommend others to stay. Thank you so much for all your assistance from the moment we walked in you made us so welcome. You all made our trip one to remember. This villa is incredible, it is something no one can ever imagine. We are so humble for all your hard work.Thank You from the bottom of our heart. Thoroughly enjoyed our stay at Villa Samadhana. The staff bent over backwards for any request.The food was first class set amongst this beautiful villa.The website didn't do the villa justice online. It well exceeded our expectations. Thank you for our stay. Thank you for this piece of dream, we had an amazing time. The place is just magical, peaceful and beautiful. Everybody just loved it. Kids, teenagers and adults. The staff always warm, helpful anticipating our every need. A perfect combination for paradise. Please keep it this way with this level of service. No other words than THANK YOU. Hoping to come back soon. The perfect setting for a perfect holiday. All the staff have been absolutely fabulous in ensuring we have all been so well looked after. The food has been delicious. Thank you so very much for everything, we will never forget villa Samadhana. Thank you so much for an amazing stay at Villa Samadhana!! We all loved every minute of it. The villa and the grounds are stunning and the pool is incredible. Also a very special thanks to beautiful staff, they were all so friendly and helpful and Wayan's cooking was so yummy. Best Holiday!! We had a lovely time. Beautiful surroundings and fantastic staff and service. We will surely be back. Thanks for the perfect setting for such a wonderful holiday. It was amazing. We all had the most amazing time. The staff were so helpful, the property is so beautiful, my family will have memories to last forever. We will miss this place like crazy! Its been an amazing time, thank you for everything. The most amazing holiday ever. Please do not make us leave. We are very happy. Bali is really good, we want to come again, very good, very good, very good! What an amazing 2 weeks we have had at such a beautiful villa. After looking at the pictures on the internet.The villa and its grounds are wonderful and all of staff have been amazing. Always there to meet our every need. Thanks to Wayan, Ari for the tasty food.Thanks to Gede also for driving us around, providing us assistance and all of the information. As soon as we walk in the Villa, we were blown away it is more beautiful than the picture, the staff is so cooperative .Tasty food, good staff and helpful manager too. I would love to visit once again, wish you are all the best. Beautiful place, very spacious, open, comfortable, with a great energy and a nice balance between group and private areas. Very courteous team to take care of guests. Amazing swimming pool and top class kitchen. It is difficult to mention only one staff as we were very satisfied with all the personal of this villa and overall our experience here was fantastic.I also want to say this villa has amazing accommodation. We really had a fabulous stay and would definitely like to return again next year. Special thanks to Villa Manager Gede for his excellent care for us and awesome hospitality. Villa Samadhana is our favourite place to stay in Bali. The grounds and the pool area in particular are stunning, an absolute haven and a beautiful place to relax and unwind. The staff are welcoming, warm and charming. We cant wait to return to the villa next time. From the moment we first walked in our jaws dropped at sheer size of the place. it is like a slice of paradise here and the whole complex is absolutely stunning and the decor is beautiful and luxurious. The service has been impeccable and we were so well treated through the whole stay. Thank you to the talented chef who made us delicious meals, our last nights dinner for dad's birthday was very memorable.Thanks again to the staff for our wonderful stay. We are 2 families from Australia with 9 people in total. From the time we arrived at Villa Samadhana the staff and facilities have exceeded our expectation. Everyone has loved our holiday in Bali and we are already planning our next trip. Every meal we had was beautiful and welcome night and final night feast exceptional.The staff were very professional friendly attentive and courteous.A big thank you from everyone to Gede and staff who made our stay very memorable. Sun, Bintang (beer), pool and milkshakes. Breakfast was spectacular every morning - the fruit mouthwatering. The chef Ari and Wayan prepared the most incredible lunches and dinners for us. Wayan even invited us into his kitchen to share some of his secrets. Putu and Krisna totally attentive, never faraway with a fresh drink or setting the table for a beautiful meal. Thank You Gede and your team. This was a holiday of a lifetime and you made so perfect for us.Thank you. What a lovely stay at such a beautiful, relaxing location. We were made to feel special from our arrival until our end and thoroughly enjoyed the delicious food prepared by the expert team. We leave with nice memories and would not hesitate to recommend Samadhana to everyone. Thanks! We are all felt very grateful for our stay at villa Samadhana. When we first stepped through the front gates our expectations are exceeded by the grandeur and warm greeting.The photo did not do it justice. Thank you for organizing everything for us. All the staff looked after our every need. Thanks also to Gede our driver for driving us safely. We wish you all the very of luck and success for the future. Gede, thank you for making our family holiday so easy + fun, you do a fantastic job with your team. Putu is a fantastic butler, he provides service from the heart, Krisna is very efficient always following up on requests.And the chef is amazing. Thank you so much we had a great time. Everyone was so nice and the food was amazing. We had such a great time thank you to all the staff who put in so much effort and made our stay unforgettable. Putu and Krisna were exceptional for our whole stay. If someone asked for a wedding location I would recommend Villa Samadhana. Thank you for our lovely stay we depreciated all your efforts, the staff are exceptional. Agus, Putu, Wayan, Krisna and all the staff were lovely. The villa is very good, staff also very good. The service of the staff has been exceptional. Good staff, we will be back to Samadhana. We love Villa Samadhana and and the team work was awesome.Food also very delicious. Thank you guys. All team members were awesome, Gede was very accommodating, Krisna and Putu service was very attentive. Villa Samadhana is a large hidden stunning property with beautiful gardens and lawns and a perfect pool and rec area. The staff were friendly and helpful and the food they prepared was delicious. We didn't want to leave! We had the best time with enough to do and great space to relax as well. Will certainly want to go back. Loved it. The villa is beautiful, peaceful and has its own charm. It is also so close to nature. However, the villa is about 1hr drive to the town. A lot of time traveling.. Nevertheless, we missed the chef's home-cooked villa meal - bak so noodle and met soto. We were three families of friends (total 10) and stayed one week at Samadhana. Great experience, wonderful staff, fantastic food and totally relaxing. I would definitely recommend a stay here. Everybody was totally amazed. The villa surpassed our expectations especially from the perpective of the beautiful grounds and the caring well trained staff. We felt pampered and our every need was attended to do. The cooking was superb and we have all missed the chef's meals on our return home. Two of our party did not leave the villa they felt so relaxed in the surroundings and the four small children had a wonderful time. For those who did go out, the expertise of the driver was much appreciated. Great for couples and family. A lot of outdoor space for kids to run around and teenagers can hang out in the media room, play billiards or swim in the pool while the mommies are out shopping or on a spa treatment. Could not fault Villa Samadhana. Staff excellent and villa was beautiful. We had the best family holiday and would highly recommend Villa Samadhana. The accommodation suited our extended family and would definately love to go back.This would be the best accommodation we have had in Bali. Our party of 12 including 5 children had a wonderful time thanks to the attentive staff and the gorgeous property. I can't speak highly enough of the staff who made us feel so at home. We loved the food that Wayan and Ari cooked for us especially that last seafood dinner. The villa was amazing in a tranquil setting of lush, expansive gardens, ponds with koi fish amd water lilies with the background sound of ocean waves and gentle sea breeze. It was heaven! We definitely will be back. Absolute paradise on earth. The most breathtakingly beautiful property and gardens. The villa is absolutely magnificent, the gardens are stunning, the pool area very relaxing. The staff were extremely friendly and keen to accommodate. For us it was just the perfect holiday and we will come back! Spacious villa, amazing gardens an oasis. Villa Samadhana is an oasis on the east coast of Bali. Conveniently located within easy access to both Sanur and Ubud, the estate offers an exclusive resort-style residence situated within an authentic village ambience. Perfect for large groups, families and weddings. A stellar staff who work continuously to ensure all needs are met! They embraced us as if we were family and looked after all our requests. All took great pride in their job and it shows! I will miss the entire staff and plan on returning to Bali on a coming holiday. 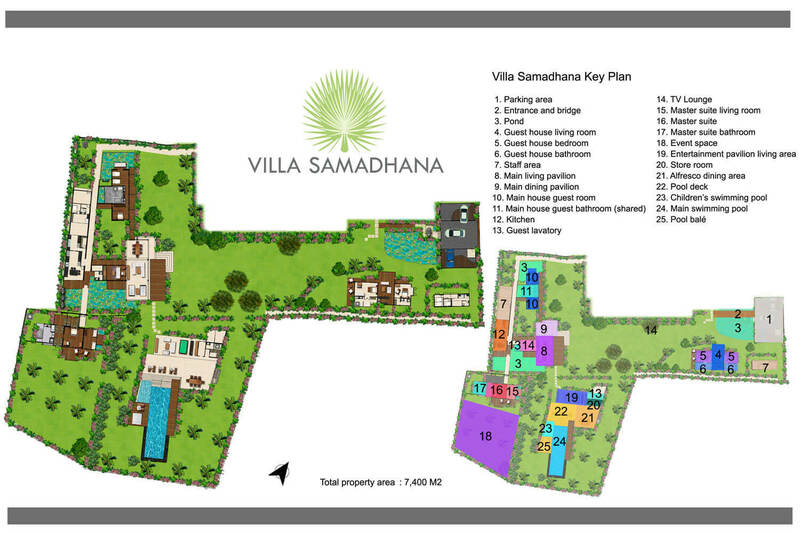 Samadhana is a beautiful villa with expansive gardens and living areas. Its location is some distance from the tourist & shopping areas of Bali however this adds to its charm, set within a traditional balinese fishing village you get to experience the cultural side of Bali. Villa staff were great, always willing to help with a smile. Our kids loved all the attention and the food was always delicious. One tip please get a coffee machine.... We would stay at Samadhana again. Really nice and good villa. Considering the villa has big area, better if we can stay more than 10 person. 15 person better. I will come again someday... really excellent villa.